Darren Jordon presents the BBC's One O'Clock News and weekend news bulletins on BBC One. He was previously the weekend presenter for Breakfast, on BBC One and BBC News 24. Darren joined BBC Sport as a broadcast journalist in 1998, as part of the BBC News 24 Sport team. 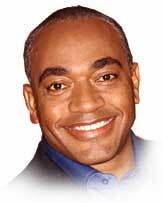 In May 1999 he made the switch to TV News, and became a news presenter on BBC News 24. He also presented on BBC World, where he anchored many international world news event and presented the BBC One current affairs programme '4x4'. Darren was educated in the West Indies and at the Royal Military Academy Sandhurst, in England. He spent eight years in the Jamaican army, where he served in the Infantry, and was an accomplished parachutist. Born in London, on 23rd November 1960, Darren is married and has two young children.